Hammel, Green and Abrahamson Architects & Engineers’ design incorporates a stone veneer product that is ‘clipped’ to the substrate and suspended using an anodized aluminum channel system. 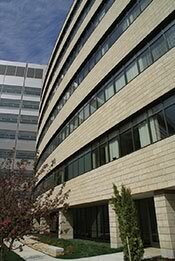 After a decade of planning and roughly three years of construction, a hospital consisting of 118,000 square feet of thin stone, 5,400 tons of steel, 19,700 yards of concrete, and 18 million feet of cable opened its state-of-the-art doors. Virtua Voorhees, “The Hospital of the Future” as it is known, is situated on 125 acres in Voorhees, a New Jersey suburb within the greater Philadelphia metropolitan area. The outstanding architectural design was cutting-edge, based upon true work-process engineering. Hammel, Green and Abrahamson Architects & Engineers (HGA) was chosen by Virtua Health to design the structure because of the firm’s highly successful background within the healthcare field… and also, for coming up with building solutions that were both aesthetic and functional. 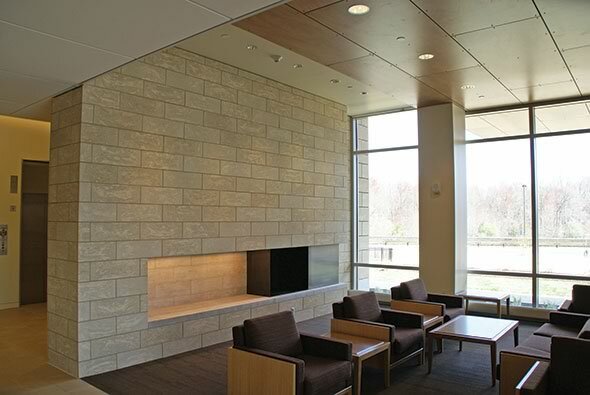 The new hospital features a stone veneer from Arriscraft. 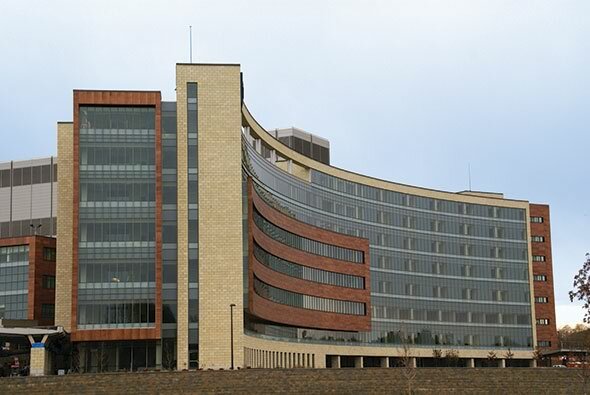 This 675,000-square-foot replacement hospital’s overall structure consists of an eight-story “curved” bed tower (with 370 beds), a nine-story “spine,” four stories of ancillary spaces, a central utility plant, and a loading dock. The tower is slightly curved to help fit the building onto the somewhat narrow site, a location that inspired certain materials to be specified. Noteworthy in the design is the exterior façade, which includes a massive aluminum and glass curtain wall, a beautiful back-ventilated and drained stone rain screen system, metal panels, and all of this was accented by phenolic resin panels of real wood veneer. These materials “create a real harmony, and something that’s indicative of what was basically unearthed from the site,” says Mark Debrauske, AIA, project lead designer, HGA. Suspending the units was one thing, but then the transition detail from the vertical wall to the horizontal soffits needed to be considered. In combination with HGA, a clever and innovative transition detail was developed. Adding to the complexity was the fact that many of the soffits were curved. Swirzon went on to state that both the installation and purpose of ARRIS▪clip units specified for this back-drained and ventilated rain screen wall system were clearly understood by those professionals working on Virtua Voorhees, as the system utilizes and builds on current construction principles and practices, therefore detailing the façade was a collaborative effort. The hospital design features a modern back-drained and ventilated “open rain screen” system. Beyond the soffits, corner details and curved walls, HGA also wanted to use modern back-drained and ventilated “open rain screens,” another first for Arriscraft. 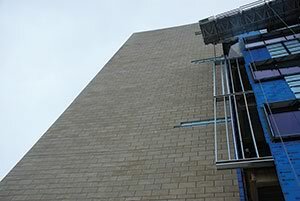 By now, most construction professionals are aware that a rain screen contributes to a more effective building envelope, but only if it is specified and installed properly. The facade, which in the case of Virtua Voorhees, was the visual unit that would be continually exposed and challenged by changing climatic conditions. 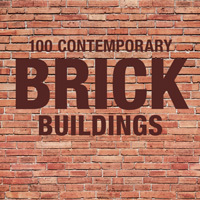 For many years, there was a belief that exterior facades should be watertight. Now, however, it is generally recognized that this is not possible and the reality is that facades should be designed to deflect moisture, channel it, and manage that moisture. 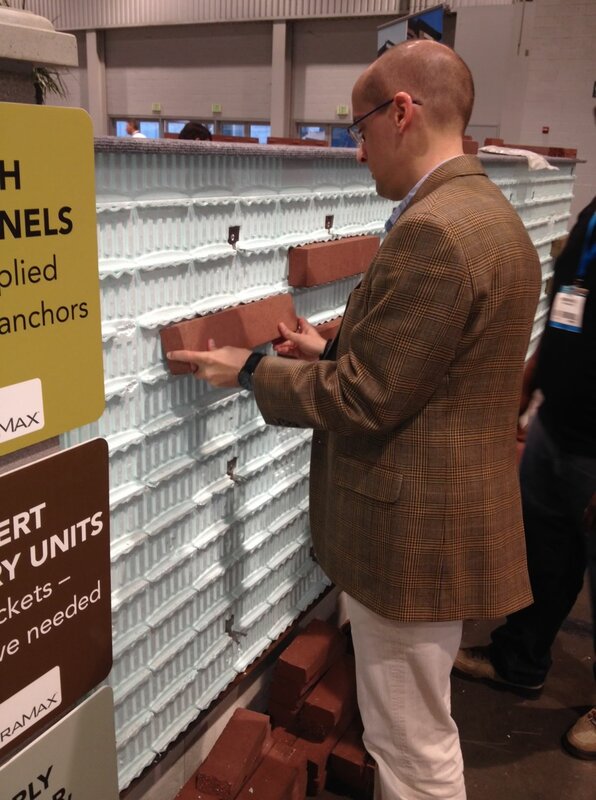 Based upon solid research, today’s rain screen systems are not necessarily produced to be 100-percent rainproof. 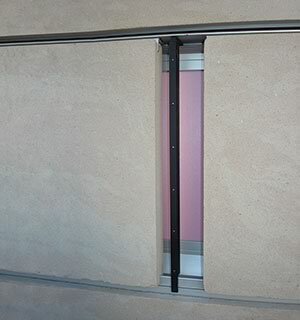 By having a system offering open or partially open joints on the building’s outer layer, this can be highly beneficial for ventilation and drainage of the cavity behind the façade and, drying of the façade itself. 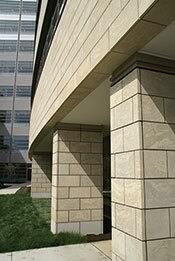 As such, modern facades should be designed with three lines of defense in mind, the façade or veneer to deflect moisture, the airspace behind the façade to allow for drainage, and the moisture barrier. “There are many systems on the market that promote 100 percent open joints,” said Swirzon. “Wind-driven rain and moisture can in fact blow past the façade and cavity through the joints. Should that be the case, then the third component, the waterproofing membrane, must be relied upon completely as the only line of defense to keep moisture out. 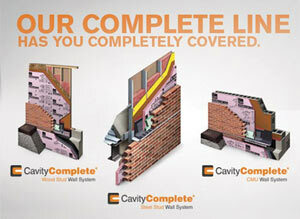 As of November 2016, PROSOCO has joined the CavityComplete® Wall Systems team. As the new air and moisture barrier partner, PROSOCO will contribute category-leading components—such as R-Guard® VB—that have been tested and proven to work together with existing system solutions to help manage air, vapor, and water movement.